Isn’t that just the most beautiful thing you’ve ever seen? I don’t mean the photograph, I’m not that big-headed (although I must admit I have improved a lot since my first ever food photo…), I mean the fooood. 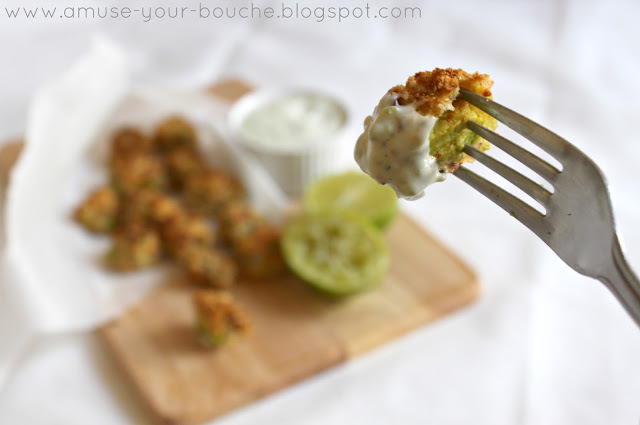 Crunchy breaded avocado – baked, not fried, of course – served alongside a tangy coriander-lime mayonnaise (that’s cilanto-lime to some of you). There has never been a more perfect combination of things (an even better combination than Cory and Topanga, or Jack and Rose, or Zack and Kelly… yes, that good). Spread the flour on a plate. Lightly beat the egg with the milk in a bowl. Spread the breadcrumbs in a third dish. Cut the avocado into fairly large dice. A few chunks at a time, roll in the flour until all sides are coated. Shake off any excess, then dunk into the egg mixture, again ensuring that it is well coated. Finally, roll in the breadcrumbs. For a thicker coating, repeat the egg and breadcrumb steps for a second time. Lay the finished pieces out on a lightly greased baking sheet, ready to be cooked, and then do the same process with the next few chunks of avocado. 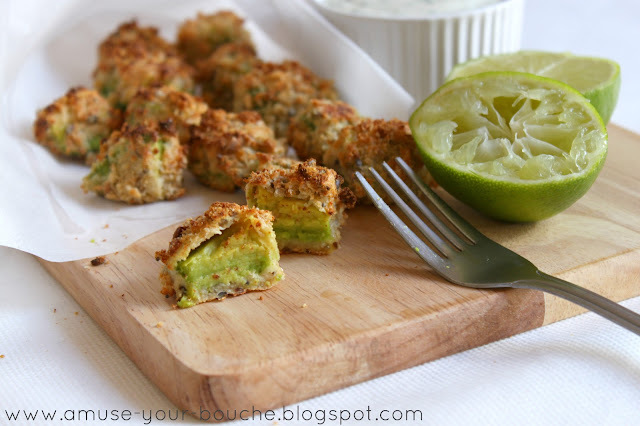 When all the avocado has been breaded, bake for around 20 minutes, or until the breadcrumbs are crispy and golden (cooking time may vary depending on the type of breadcrumbs you used, so check them occasionally). 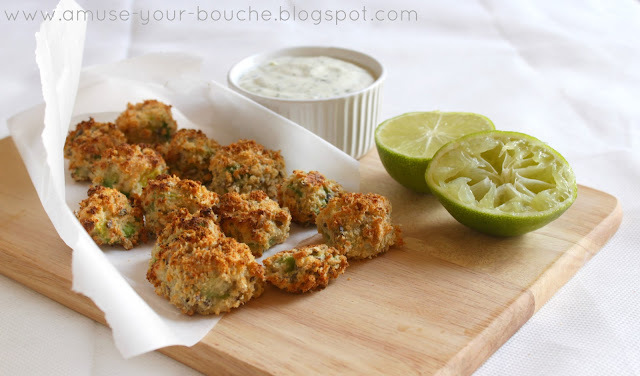 While the poppers are baking, prepare the coriander-lime mayonnaise. Place the coriander and lime juice in a mini food processor, and blitz well. Then add the mayonnaise and seasoning to taste, and continue to blend until you have a fairly smooth mayonnaise. 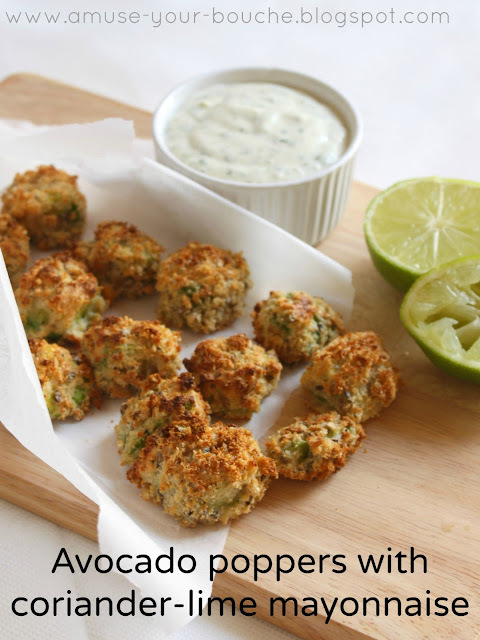 Serve the warm avocado poppers with the mayonnaise. They look great I will be making them on the 24th for our big Christmas party ! These look and sound amazing. I love avocados. And I’m a huge fan of lime as well. This is going on my list to make soon! Thanks for sharing at Saturday Dishes. This really sounds good and your pictures look so YUMMY! Thanks for linking up to Saturday Dishes. I Pinned it! These look amazing!! Not sure you can get a better combination than Corey and Topanga though! I love avocado but I would have to skip the mayo. Just not a fan! Anyhoo, couldn’t resist popping over to see these avocado poppers. Pinning this too! A must make! So glad I saw them on my group page party! Wow – I must try this!! Looks amazing! Think the recipe will work with other veg as well as avocado? Sounds good!Going to give it a try:) Thanks from west virginia. These look so crispy, I was sure you had deep-fried them. I love that they’re baked instead! Oh damn, these are definitely being made as a side for dinner tonight! Ugh! omg, that mayo sounds amazing! I love that these are baked. Do they stay green inside? Or do you have to eat them all immediately? I looove avocado but hate how quickly it browns! i looooove avocados so much! this looks perfect! i don’t think i could even cook this as well as you did :) but id love to try it!